When we say local, we don't mean dining at the local Thai restaurant. We're talking local farmers markets, using local fruit and veg box schemes, shopping at coops, swapping veggie garden produce with the neighbour - that kind of thing. In doing so - that's eating locally grown food - we encourage the maintenance of wildlife friendly hedgerows, pastures and gardens, says The Wildlife Trusts magazine Natural World. It's all about the old supply and demand way of things. Economics tells us that the more we buy (or try) shows suppliers we want to buy more. So they go out and find/grow/make us more. If we continue to show local growers that we want local they will find a way to do that. A desolate concrete courtyard could be turned into a flourishing pumpkin patch or strawberry field with a little help from a local allotment gardener. Well that sounds nice and dandy but renovations of any sort take money to bring them to life. 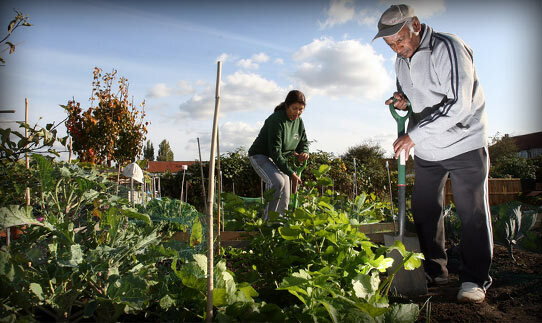 The Wildlife Trusts have been given £50 million of Lottery money to support projects which make local food more accessible. The Trusts aim is to award 1,000 projects grants from anywhere between £5 and £500,000 by 2014. Now that's something of a motivator isn't it? Other than encouraging wildlife, eating local also reduces your food miles and therefore your carbon footprint. 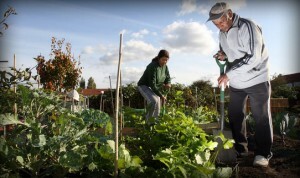 Also by supporting local farmers and allotment owners you help to keep local green space from going undeveloped. So it really is worth getting your natters on some home-grown veggies! For more information the grants visit localfoodgrants.org.